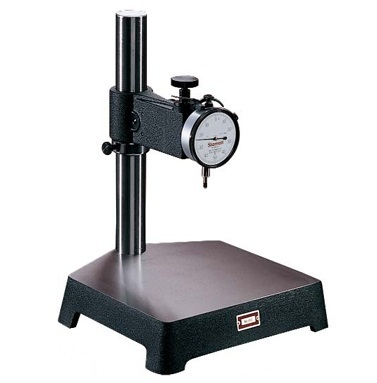 The Starrett 653 Dial Comparator with Cast Iron Base is ruggedly built for in-process and final inspection work. The dial indicator can be adjusted vertically and locked in any position. A sliding ring with locking screw below the beam permits swinging the indicator to either side. The ring also acts as a safety device, preventing the beam from accidentally dropping. There is a fine adjustment on the beam for final indicator setting. The hand lifting lever on the indicator raises the spindle and releases it to contact the work. Left hand lever furnished unless otherwise specified.